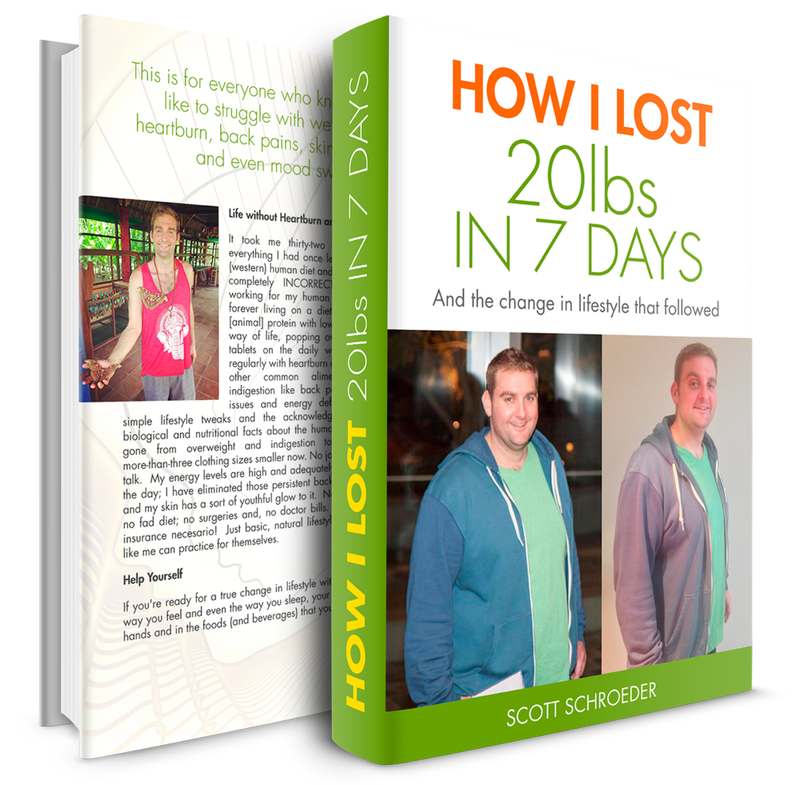 Hi, my name is Scott Schroeder and this is my personal success story of my (former) lifelong battle with weight loss and weight management. I used to be a victim of the Standard American Diet (SAD), struggling with heartburn, back pains, body aches, skin issues, energy deficiencies and all of the other common health ailments associated with indigestion and bad eating habits. After acknowledging some basic biological and nutritional facts about the human body and digestion, I devised a weight loss plan that resulted in me losing twenty pounds of weight and dropping two whole clothing sizes in just one week. I have put together the step-by-step instructions of my personal weight loss victory to share it with others who are currently just like I once was, struggling with weight loss, heartburn, persistent back pains, skin care, sleeping and even mood swings. This is not some sort of hyped diet fad, crash diet scam or juice only fast where you starve and deprive your body of essential dietary nutrients, nor do the steps that I used to lose so much weight entail any rigorous workout exercises where you burden your body for long amounts of time at a gym (on the contrary, I ate only delicious foods each day of the entire week that I lost my 20lbs and, the only times that I went to the gym during that week were once before to use the scale for weighing in and once after to use the scale for weighing myself again). If you're anything like me, you've tried just about every diet on the market, from the Atkins diet to the high protein, no complex carbohydrate diet; the calorie counting diet, the Paleo Diet, the Weight Watchers Diet, the Nutrisystem Diet, et al and, I bet none of them ever worked for you either! Since I lost my first 20lbs of weight, I have chosen to ignore all of the new hype diet schemes coming out and have stuck with what I know that actually works (and is natural to the human body) when it comes to losing and maintaining weight. Save yourself the time and hassle, too, ditch the bogus diets and discover how to lose weight and keep it off. If you're ready to finally lose weight and keep it off, the next step is yours and yours only to take. The blueprint that I used to lose 20lbs of weight in seven days can and will help you to shed an enormous amount of weight from your body in just seven days but, you have to make the choice for yourself and be committed to yourself. Are you ready? When you download my weight loss eBook, you will learn exactly what I did to lose a truly noticeable amount of weight (while managing to keep it off) plus you can always contact me for hands-on support and further guidance should you need any additional help what-so-ever. I am here to help you achieve your weight loss and overall health goals.